The design process at Rhine Pools plays a major role in the look of your finished swimming pool. Our experienced Landscape Architects and designers draw up plans that incorporate the swimming pool and other design features – including landscape elements, pool decks, patios, outdoor kitchens and bars, shade structures and pool houses, fireplaces and fire pits, sports courts, LED lights and more – to create a cohesive, inviting outdoor living area. Over the years Rhine’s Landscape Architects have been called in when ordinary pool companies have told homeowners that their property will not accommodate a pool. “Too steep.” “Too close to the septic or property lines.” “Too difficult.” Those were the excuses other pool companies gave, but Rhine Pools got the job done. Being able to utilize our Registered Landscape Architect is a huge difference with Rhine Pools. Our process is simple. After you have contacted Rhine Pools, one of the employees from our sales and design team will come out to your home for a face-to-face site meeting. During this meeting, we will listen to your dreams and learn about your wants and needs. We will discuss your budget and gain an understanding of the project area. 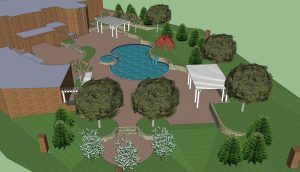 If you have a more difficult site with elevation challenges, property line or septic issues, or a more complex design idea that requires the talents of one of our Registered Landscape Architects, a design agreement will be provided for you. This design agreement will outline what is expected from your Rhine Architect and the cost that is associated with that level of design. After reviewing the agreement, signing it, and providing the payment, you will begin the design process that will lead to the backyard of your dreams. 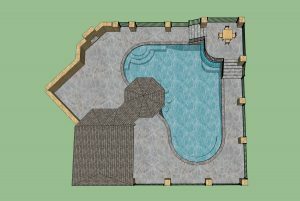 When we produce your custom pool design, we strive to include the features that you have envisioned and use your guidance to help us arrive at the right design. After you have reviewed the plans, our team is open to discussion about your project. Rhine Pools values the bonds we build with each client, and helping you realize your dream of an outdoor living experience is what we are all about. Once you’ve chosen a suitable design, you’ll receive a contract that clearly states the scope of work and the cost. But your Rhine Designer doesn’t stop there; we can help you with any HOA or Association paper work and drawings if they are needed. We will investigate and help if any county variances are required because of possible septic or property line issues. Rhine Pool’s design department is a feature that helps distinguish us from the rest of the pool builders and landscape companies in the market. We work with you so that what you desire becomes reality – and culminates in an outdoor living space that you’ll enjoy for years. Contact us today with questions at 410 442 2445.